BMW unveils new M Performance parts for the BMW M3, M4 Coupe and M4 Convertible. 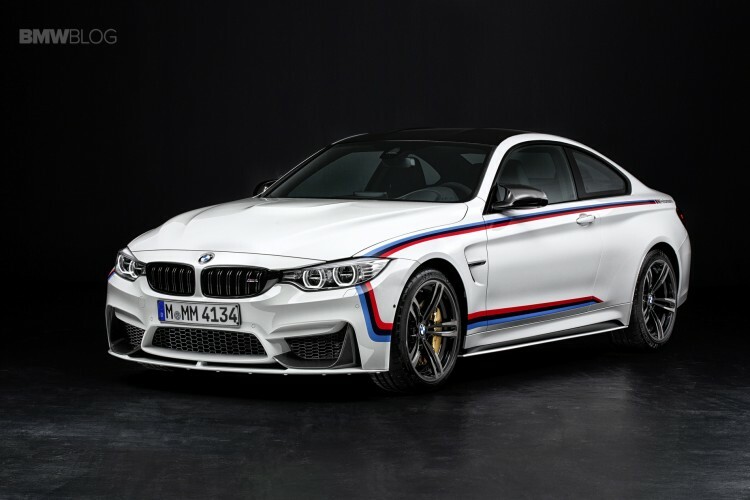 The BMW M Performance steering wheel with Alcantara covering, carbon trim and Race Display does its bit to ensure the BMW M3 and BMW M4 deliver a particularly full-blooded driving experience. The painted carbon steering wheel trim carries “M Performance” lettering. 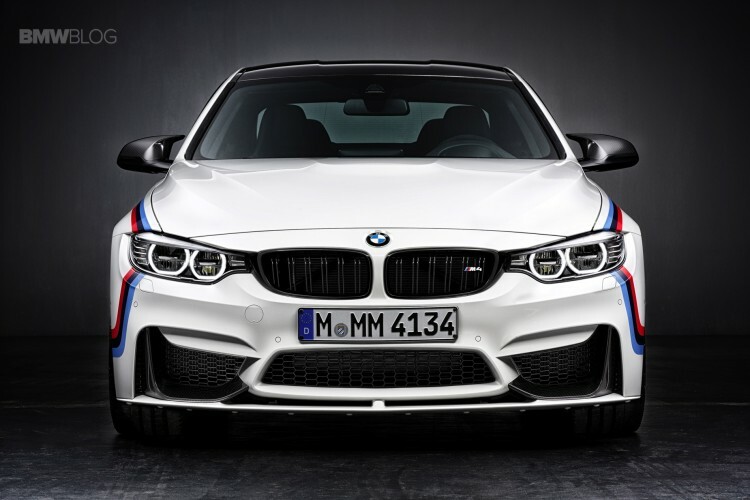 The Alcantara covering for the steering wheel rim has contrast stitching in the three BMW M colours. And the thumb rests feature a pair of embedded buttons used to activate Efficient Dynamics mode, Sport mode and Race mode. 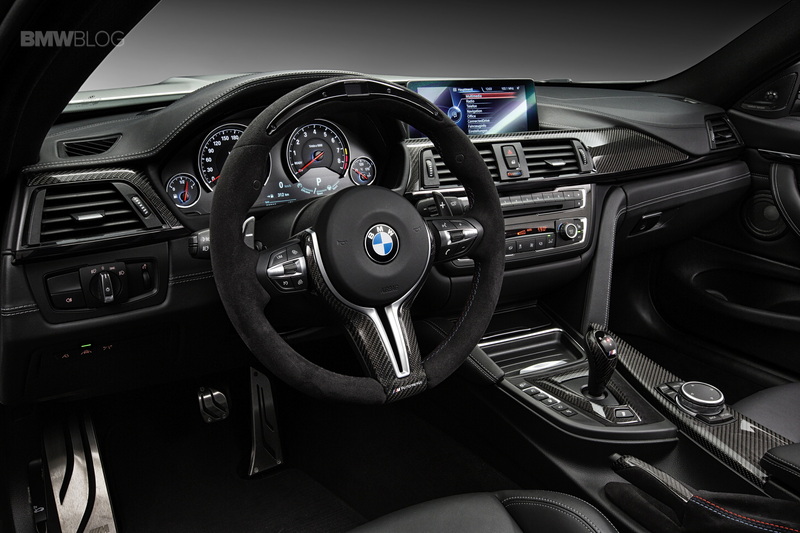 The driver can use the integrated display at the top of the steering wheel rim to view gear change signals and lateral/longitudinal acceleration figures, among other things. Sport mode gives the driver access to a stopwatch function with displays for hours, minutes and seconds. Lateral/longitudinal acceleration figures are also shown. During committed track sessions, Race mode allows lap times to be displayed and stored in minutes, seconds and hundredths of seconds. The top speeds and maximum lateral/longitudinal acceleration figures for the most recent 50 laps completed can also be stored. The BMW M Performance silencer system developed specially for the BMW M3 and BMW M4 uses optimised exhaust gas channelling to generate an emotion-rich engine soundtrack that underlines the performance characteristics of the biturbo straight-six engine in stirring fashion. The lightweight flap control exhaust system comprises a stainless-steel exhaust system and a silencer made completely from titanium and displaying M Performance lettering when viewed from the rear. 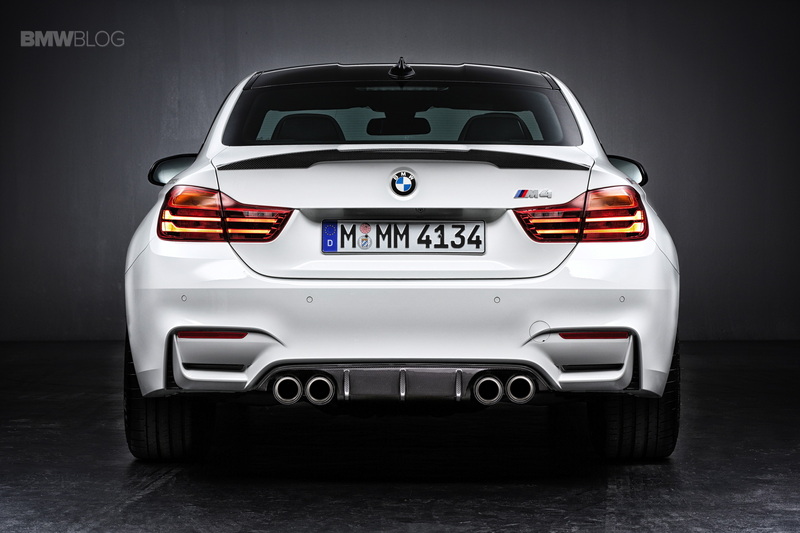 A distinctive stylistic highlight are the classy tailpipe embellishers, in either titanium or carbon, with M logo. 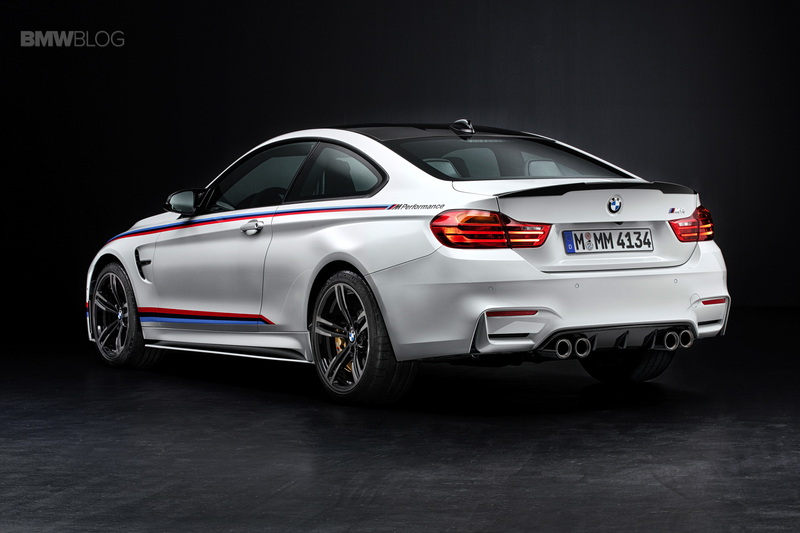 The use of titanium ensures the BMW M Performance silencer system is exceptionally heat-resistant, corrosion-resistant and lightweight. Indeed, it weighs around eight kilograms less than the standard item. 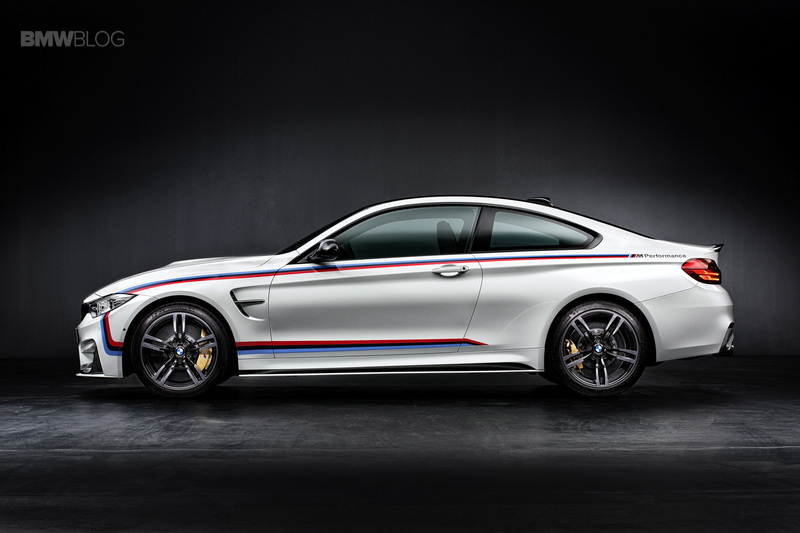 The driver can choose from two settings for the sound characteristics of the BMW M Performance silencer system, both of which are linked to an engine performance profile that can be activated at the touch of a button. In Standard mode, the sound development is already much more dramatic than that of a regular model, has a defined sporting edge and is also suitable for everyday use. In SPORT and SPORT+ modes the development of power is accompanied by a stunningly powerful, emotionally rich soundtrack, which gives the driver extremely clear feedback on engine load.